Also pictured is the UVM 2nd year student ambassador Matt Spargo who accompanied the team during the 5-day event. The team traveled to Burlington, Vermont from January 8th – 13th to participate in the 6th annual Global Family Enterprise Case Competition. In the undergraduate division of the competition there were 13 international teams from countries including Mexico, Canada, The Netherlands, Germany and Malaysia. Graduate teams representing the US, Australia, Sweden, the Phillipines, Canada and France attended. The OSU team was assigned to a division with four teams. After presenting the pre-arrival case, the team placed 4th of four teams. The following day the team placed third of four teams and on the final day the team again increased their ranking to place second in their division. At the end of the competition, the team was tied for 8th of 13 undergraduate teams. At the finalist recognition reception, Judge Randy Waesche came over to the OSU team to congratulation the students on their participation and noted that they should be very proud of what they had accomplished for their first time in the competition. 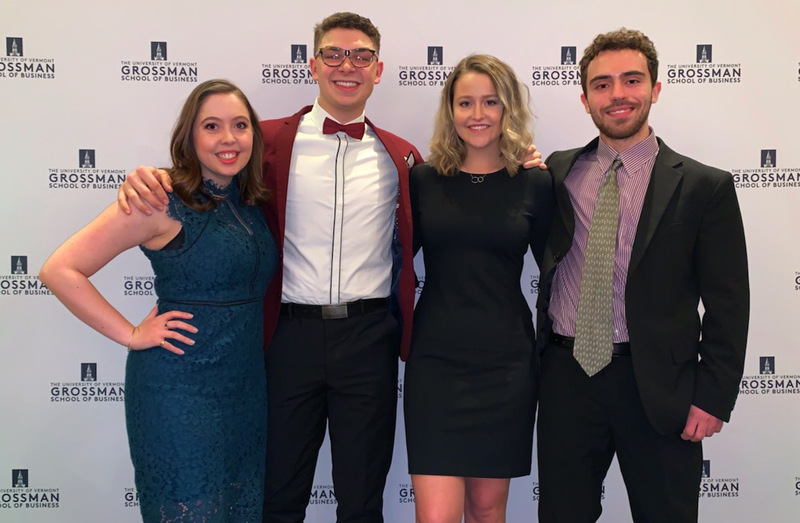 Because two of the three team members were second year students, the OSU team had 8 years of business education prior to competing compared to the competition average of 10.7 years of business education per team. Congratulations to the OSU Undergraduate team for a great first showing at the competition, and a special thank you to team coach Dr. Sherri Noxel! For complete information on the Global Family Enterprise Case Competition please visit the University of Vermont’s competition webpage. PORTLAND, Ore. – Several Oregon family businesses will be honored at the Oregon State University College of Business’ 2018 Excellence in Family Business Awards ceremony Thursday, Nov. 15, at the Sentinel Hotel in Portland. Port Blakely, a fifth-generation family enterprise headquartered in Seattle, will receive the Dean’s Award for Family Business Leadership, which is sponsored by the college’s Austin Family Business Program. Siblings Gabrielle and Dylan McEntee, fourth-generation leaders of Mo’s Seafood and Chowder, will emcee. Founded in 1985, the Austin Family Business Program provides inspiration, education, outreach and research to support family businesses. “We’re celebrating a strong group of businesses, from second- to sixth-generation companies, that showcase entrepreneurial families in diverse industries throughout Oregon,” said Sherri Noxel, the program’s director. Family Harmony: Tec Laboratories, Inc., Albany. Finalists in the category included Abbott & Associates Professional Placement, Inc. of Portland and Nicholas Restaurant of Gresham. Generational Development: C.M. & W. O. Sheppard, Inc., Hood River. Lee Farms in Tualatin and Stehn Family Funeral Homes, Inc. in Milwaukie were finalists in the category. Business Renewal: Forest Hills Farms, Inc., Cornelius. Finalists included C & R Remodeling of Salem and Paddington Station of Ashland. Student Award: Madeline Mullins, Western Precision Products, Inc., Tualatin. To reserve a seat, register online or contact Melissa Elmore at Melissa.elmore@bus.oregonstate.edu or 1-800-859-7609. About the OSU College of Business: The College of Business educates students for success in managing and developing sustainable, innovative enterprises in a dynamic economy. With strong graduate and undergraduate programs, internationally recognized scholarly research, and an emphasis on experiential learning, the college helps students and businesses succeed. Family Business 360 continues to be the top destination for families in Oregon and SW Washington who are working on solving their most pressing family business challenges. Over the past five years, 34 expert presenters have delivered timely family business education to over 1,450 family business members. The sixth season of Family Business 360 launches this Fall with another slate of valuable topics. Don Bielen and Paris Powell of Perkins and Company, along with second-generation family business guest Bruce Burns of Burns Brothers Inc., will talk about how to craft a fair and effective transition plan by taking into account the often competing dynamics of family, personal and business interests. This event will provide an excellent overview if you are new to succession planning or just need another look at the important concepts. Register today to save your seat. More information and registration. The November breakfast event takes a deeper look at non-family managers and senior leaders. At what point should a family business consider bringing in outside managers, and how exactly is it done? Most family businesses that plan to transition ownership to the next generation of family also envision continued family management and leadership. What happens when there aren’t family members who have the interest to lead the business, or need more time to develop business and professional acumen before taking a leadership role? Brad Parrott of VergePointe LLC will break down how a family can assess their need for non-family management and offer practical advice on where to look for and how to hire the right people. More information and registration. The program concludes 2018 with an online webinar that takes a look at some scenarios that can cause leadership gaps in your family business. How do you know if you have a leadership gap in your family business, or if the current ownership transition plan will create one? Jim Grew of The Grew Company will lay out several scenarios where leadership gaps occur, including owner retirement, partial sale of the business, and lack of generational development. Through real world examples Jim will share common remedies for each scenario and how they could be implemented in your business. More information and registration. For up to date information including registration links for all 2018 and 2019 events, visit the Family Business 360 webpage at the Austin Family Business Program. Each year the Oregon Century Farm and Ranch Program honors families who have continuously farmed or ranched portions of their original family acreage for more than 100 years. That distinction makes them some of the longest-lasting family businesses in the state. This year, 12 new families will join 1,200 already recognized Century Farms and Ranches in Oregon. In addition, two families will be honored as Sesquicentennial Farms & Ranches; a designation awarded when a farm reaches 150 years of continuous family operation. Families will be honored at a ceremony at the Oregon State Fair on Saturday, August 25 at 11:00 a.m. in the Picnic Grove Area. The public is welcome to attend this special event that celebrates Oregon’s agricultural heritage. Visit the Oregon Century Farm and Ranch Program online for more information. Are you curious about what’s inside an application for the Excellence in Family Business Awards? The Excellence in Family Business Award application can be a valuable tool for both your family and business. Completing an application will help highlight areas of family business in which you excel or where you may need to focus more attention. It’s also a great way to spend time with other family members to talk about the future and legacy of the business. Aside from contact information and a few questions about your particular business, the application focuses on three categories of family business excellence: family harmony, business renewal, and generational development. The questions allow the judges to understand your family business strengths, and after consulting other family members and reviewing your business processes, you will have a deeper understanding where your enterprise excels and where you need to focus for improvement. You can complete an application online or contact Melissa Elmore at Melissa.elmore@bus.oregonstate.edu or 541-737-3326 to request a hard copy application in the mail. For more information visit the Excellence in Family Business Awards webpage. Starting a board of directors is frequently cited by family business owners as something they know they “should do.” In fact it’s a perennial top request for new family business workshop topics. With all of this reported interest, it’s surprising that only 48% of family businesses have actually instituted a functioning board. Two important considerations about boards may help tip the balance: (1) A board can be customized to fit any size or structure of business and (2) the process of preparing for a board, even before the board is fully implemented, has benefits for an operating family business. A functioning board signals that a business is building for growth, diversification, expansion and innovation. Why is a board such a powerful business accelerator? A successful family board chairman described his top directors as experts “who can look you in the eye and tell you that your breath stinks.” Objective opinions can change the possible trajectories driving calculated shifts in product lines and skill development in employees. As a business owner your board becomes a team of specialists studying your business with the focused intention of making the most of the enterprise you have built. Nonfamily directors are needed in addition to the hired business professionals that are often used as informal business advisors. Accountants oversee financial issues and recommend tax strategies. Attorneys help to mitigate risk and protect assets. These professionals also desire long-term relationships with your business and may be less inclined toward risk or promoting change. Industry data exchanges and study groups provide benchmarks to assess business performance and identify industry trends. Peer forums provide personal development and self-reflection to develop transformative leaders. Board members integrate all of this information at the enterprise level to provide new insights and perhaps, cautionary tales. In addition to business development, a board strengthens family focus and discipline. Next generation leaders often report to me that the family behaves better “when there are outsiders at our meetings.” Time dedicated to preparing agendas and financial statements in advance of the meeting is required to support decision-making and analysis. One executive told me “I do this because I respect the business and the legacy that my family has built. I prepare our documents for the meetings and put on a suit and a tie.” This is an opportunity to clearly model responsibilities as stewards of the enterprise. Advisory boards also facilitate connections to the business successors. Setting objective expectations and using their experience to develop and mentor young leaders facilitates a transition that may seem many years away but will arrive quickly. In fact junior board structures where young family members are tasked with managing the family’s community donations are being used to teach responsibility, due diligence and reinforce the family’s philanthropic values. Preparation starts with long-term business planning and conversations with family owners and family employees. Knowing where your business is headed long-term clarifies the expertise and resources that are needed to succeed. Is the owner planning to retire and needs input on succession and transition planning? Is the firm’s goal to move into international markets? Will there be a possible acquisition of a similar business in the future? The payoff is a set of focused experts committed to achieving your business goals and bringing their expertise to bear on the problems encountered along the way. Create a prospectus that documents the expertise and experience that is needed, the annual meeting schedule and the compensation to be provided. It will serve as a reference document for recruitment and screening of potential candidates. The expertise sought should align with the future business plans and complement the experiences of family board members. The prospectus will be useful to business community contacts and hired advisors who will help recruit candidates. A well-prepared prospectus will focus the search and attract higher caliber candidates. Candidates should not accept the assignment until they have reviewed the documentation and been vetted by family board members. Close business associates or golfing partners who have long provided informal input could serve as trusted board directors provided they can meet the “bad breath” standard. A large board with a majority of independent directors having fiduciary responsibilities and formal voting processes is not a good fit for smaller businesses. Advisors without these powers or responsibilities are a starting point. But this advisory board should be part of a formal governance structure that separates ownership decision-making from family issues. The numbers of directors will vary with each ownership structure. Family members sit on boards to connect business decisions to the family’s values and to shareholder interests. Nonfamily members provide the extra set of eyes and areas of expertise that are of interest for the company. First-time smaller advisory boards should select at least two nonfamily members. Chairs of family businesses are highly sought as board members because they understand the value and culture of family ownership. Compensation varies from nominal honoraria to prorated amounts based on the hourly rate of pay earned by the chief executive. The expectation of time invested for each meeting should drive the consideration of compensation. Motivated business executives are often interested in the experience of helping to grow a company over the monetary reward. Think of the compensation as an investment made to improve business performance. Establishing a board is not a short-term fix and requires critical planning for the largest gains. Lack of time may be the reason that less than half of family businesses implement boards. Another obstacle may be the reluctance to share financial data and accept questioning from experts outside of the operation. CEOs that realize it’s better for a new idea to fail in the board room than in the marketplace are willing to have transparent discussions. A podcast on Advisory Boards in Family Business is available on the Austin Family Business Program website and features an in-depth interview with Tom Kelly, CEO of Neil Kelly Inc. and Greg Waggoner, Chairman of Leupold & Stevens. Their viewpoints and experiences may provide additional insights. The Austin Family Business Program defines family business excellence as strong family harmony, active development of next generation leaders and a sound business infrastructure that will support business growth after the departure of the current family owner. Active boards, that include external directors, make it clear that your family is serious about advancing the business to a higher level of excellence. PORTLAND, Ore. – Several Oregon family businesses will be honored at the Oregon State University College of Business’ 2017 Excellence in Family Business Awards ceremony on Wednesday, Nov. 7, at the Sentinel Hotel in Portland. Zidell Marine Corporation, a 55-year old iconic Portland family business, will receive the Dean’s Award for Family Business Leadership, which is sponsored by the college’s Austin Family Business Program. Upwards of 80 percent of Oregon’s businesses are family-owned. The Austin Family Business Program, founded in 1985, provides inspiration, education, outreach and research to support family businesses. “These families are intentional about involving all of the generations in the business and offer great examples of success,” said Sherri Noxel, director of the Austin Family Business Program. Family Harmony: Miles Fiberglass & Composites, Inc., Happy Valley. Finalists in the category included Myers Container, LLC, Portland; and Optimize Technologies, Oregon City. Generational Development: NiceBadge, Grants Pass. Higher Taste of Portland and the Portland Pet Food Company were finalists in the category. Business Renewal: Domaine Serene Winery, Dayton. Finalists included Chown Hardware Portland and Western Precision Products of Tualatin. Student Award: Geoffrey Wildish, Eugene. Brett Baker, president of Austin Industries LLC, will emcee the awards event, which begins with a reception at 4 p.m. and the program at 5:30 p.m. Tickets are $45 for the reception alone; $75 for the reception with a buffet dinner; or $25 for children ages 3-10. The Sentinel Hotel is located at 614 S.W. 11th Ave., Portland. To reserve a seat, register online at business.oregonstate.edu/familybusinessonline or contact Melissa Elmore at Melissa.elmore@bus.oregonstate.edu or 1-800-859-7609. The deadline to register is Oct. 26. It’s never too early to start working on your succession plans if the future of your family business involves the next generation. The Fall 2017 schedule for Family Business 360 is loaded with great topics and top-notch presenters to help you move your plans forward. Topics include defining your succession strategy, avoiding estate planning mistakes, implementing advisory boards, and more. Follow the links below for more information and registration for each event, or call 800-859-7609. Registrations are $40, with a 25% discount available for three or more. Events are limited to family business owners, family members, and key personnel. Visit the Family Business 360 web page for complete details. Spring 2018 events will be added soon. Building the value of your family business is not just about private equity investors and acquiring other firms. There are a variety of internal practices that a family business can undertake to build sustainable value in the enterprise. Here are four takeaways from the Family Business 360 podcast episode “Building Family Business Value from the Inside Out” featuring Francis Brown of Key Private Bank. Listen to the complete episode online for more insights on building the value of your family business. A high-value business will increase your options when it comes time for an ownership transition. If the next generation of family will take over ownership then you will be transferring a healthy, robust business. If plans change and a sale outside of the family becomes necessary, you will more likely receive your desired value in a sales transaction. “Valuation gaps” occur when the market values the business lower than the owner’s expected value. This gap can cause big issues with transitions. Research in 2016 by Pepperdine University confirmed the magnitude of the problem; valuation gaps account for 40% of failed ownership transactions. Using a professional valuation expert can help avoid overestimating the value of your own business. Business owners often employ “quick fixes” to increase value. Short-term tactics that aim to boost sales or cut costs can actually have a detrimental effect on business value. A rapid increase in sales may look good on the balance sheet, but your organization may not be able to handle the increased volume, leading to missed orders and lost customers. Sustained cost cutting may lead to lower-quality customer service and employee burnout. Both of these scenarios increase your business risk and lower your business value. One way to increase the value of your business is to reduce your cost of capital. You can achieve this by Increasing your quality of operations in eight key areas: leadership, management, people, operations, sales, marketing, legal and finance. Companies that focus on strengthening these areas will generally have a higher value than similar companies with the same EBITDA and levels of market growth. Listen to the complete episode online for more comments and insights on growing family business value. Thank you to Francis Brown of Key Private Bank for appearing on the podcast. Healthy family business communication rarely happens all by itself. Without awareness and effort by all parties to keep it moving smoothly you may find communication sliding off course, leading to misunderstandings and conflict. Here are four takeaways from the Family Business 360 episode “Avoiding the Ditch: Keeping Your Family Business Communication On Track,” featuring Mark Wickman of Family Business Counsel. Listen to the complete episode online for more insights on family business communication. Clear communication requires an increases level of awareness. By working to increase our self-awareness along with awareness of what’s happening in our family and our business, we can start to better understand what potential motivating factors affect the people in our relationships. “If that kind of thinking becomes contagious and awareness increases we’d be much better off in our families and our businesses,” says Wickman. People value things differently. Some people may place greater value on money, some on the legacy of the business, or others may value the ability to be creative on the job. By understanding how other people assign values we can communicate more clearly and avoid misunderstandings of motivation. “If I speak your language there’s going to be less chance for unnecessary conflict. When we clarify what matters to you and what matters to me, where there is conflict, we may actually be able to find common ground,” says Wickman. When family communication seems stalled, an outside facilitator or trusted advisor may help resolve issues. Because this outside party doesn’t have a vested interest in the family dynamics, they can act as an objective voice to share comments and concerns among family members. Mark says “the space created by that third party opens up room so that I can hear something [from another family member] that I couldn’t prior, and vice versa.” In other words, it may be easier to hear certain things from a third party than it is to hear from a sibling, parent or child. Listen to the complete episode online for more comments and insights on keeping your family business communication on track. Thank you to Mark Wickman of Family Business Counsel for appearing on the podcast. © 2019 Austin Family Business Program, all rights reserved.